Lying to the south of the city of Valencia, the Albufera freshwater lagoon is one of the most important nature areas in the Land of Valencia. A slim strip of coastline protects it from the sea, and on this strip of land, sand dunes have formed, plus a curious Mediterranean pine forest growing in sandy soil with rich shrubbery. This area is called the Devesa del Saler, a word derived from a kind of pastureland. Three canals (two natural and a third man-made), connect the lagoon and surrounding wetlands with the sea, and each has its own characteristic flora and fauna. 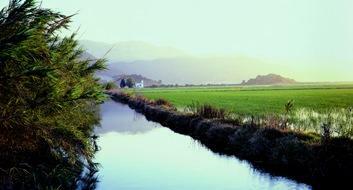 La Albufera is an important stopover point for migratory birds and a nesting area for resident birds.